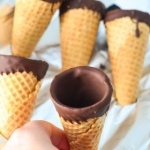 Chocolate Dipped Ice Cream Cone Recipe! Save money and make your own Chocolate Filled Ice Cream Cones just like those ice cream cones you find in the freezer section! Melt chocolate and coconut oil together over a double boiler. Once the chocolate is completely smooth and melted start filling the cones and drain out the excess. Repeat until all cones are finished and allow to harden in the fridge for at least 30 minutes before using.